The last time I made quinoa, it tasted delicious, but I totally burnt a bunch of it and my pan. This time, I actually go it right! Two times to perfection, hell yes! In a large bowl, combine the quinoa and chicken, and add sauce to your liking. I used about 3/4 of the jar. Spray or wipe a baking dish with oil and put half the mixture in, then half the mozzarella cheese. Repeat with the other half of each. Add bread crumbs and parsley on top, cover with foil, and bake at 375 degrees for 10 minutes. Uncover and cook for an additional 5-10, or until cheese is starting to brown. Mine didn't come out nearly as pretty, but it was definitely delicious. 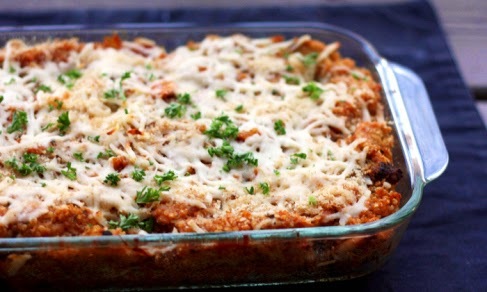 It's really just another "healthier" way to make your traditional chicken parmesan! I'm into it. It'll definitely be made again.